how fast are you going? Start @ 10.6 mph. and dial it in from there. I have the exact same boat and our wakes look different. When I surf the boat, I only put a 750# in the surf side rear locker next to the engine and if I have a passenger, I make them sit on the surf side furthest towards the back of the boat. I also fill up a an additional sac to about 200# on the surf side floor near the observers (for regular) or captains seat (for goofy riders). We typically ride at 10.3mph although that can change a little from time to time depending on our passengers and wind. You might be over-weighting your boat. Next time you go out, only take people that have patience and make them help you experiment with the weight configuration. 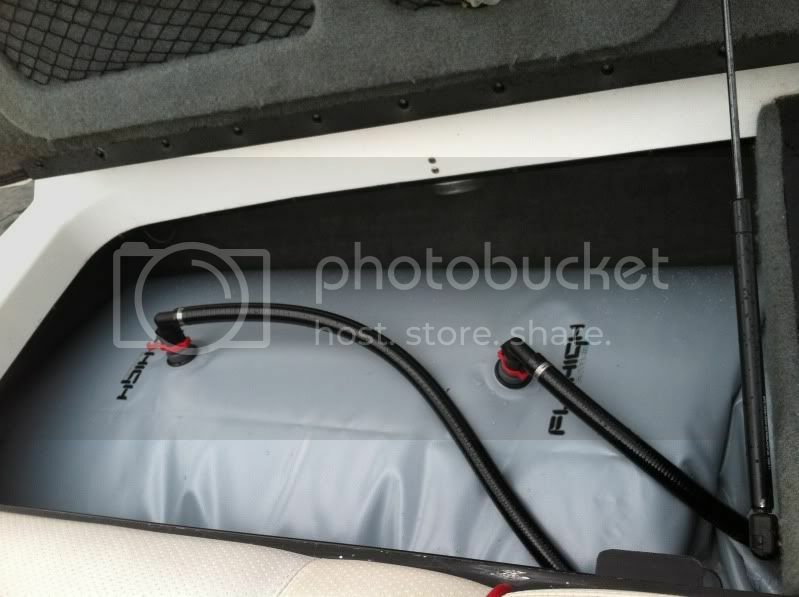 Try removing the bow, center ski locker, and lessen the amount you put on your surf side. If your passengers can't sit on the surf side, only put the lightest one on the opposite side. Although the push of the wave is a huge part of going without the rope, it's not quite all of it. Spread your weight out evenly on your board and learn how to pump. Leaning forward slightly, using your front knee as a joystick, will get you going forward. Pressing down with your back foot will make you fall back on the wave (don't press too hard). Here are a few clips of our boat. It looks like you have slack in your line so that's good. What a lot of beginners have a hard time with is throwing the rope. It takes away your balance for just a split second which causes you to loose your lock on the wave. Try just tossing the rope just enough to get it on the other side of the wave. Make an effort to try to keep as still as possible when you do drop it. Also leave the rope in the water, dragging behind the boat. People shifting around in the boat to gather the rope can change the wave for those short seconds and cause a beginner to loose balance just enough to make you loses the wave. You also want to find the sweet spot of the wave. Know where that is so if you get in trouble, you can go right to the sweet spot to make your recovery. Those pictures were just taken at the right time. I'm having trouble finding the sweet spot. So here's something to try that I sort of stumbled upon that really works : instead of looking at the wave the whole time, look instead out at the horizon in front of the boat. Sounds silly but I'll tell you why this works. Finding that "spot" is somewhat innacurate , because that "spot" is always changing ever so slightly . I've found that waiting til your eyes notice the balance adjustment that needs to be made on the board to either "speed up" or slow down" is too late . Eyes on the horizon gets you to "feel" instead of see exactly when your board is being pushed or not . Not sure if I'm explaining it right , but it's true for me . 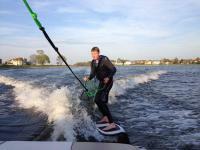 Probably boat speed, the koal is a fast board and I can ride behind my boat ropeless at 8mph. Sure I won't have the best wave or length but I can do it. 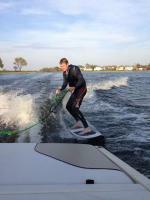 I found 10mph to be to fast as the wake flattened to much and was to long. But we have completely different boats/hulls so it's pretty variable. I'd try slowing down a touch though and I bet you'll have no problems riding ropeless. Once you get the feel of ropeless you can adjust the speed as you'll have better control. and watching that video i would say my wave is much larger than the port wave in that vid. and the angle is just different. also that board you're riding is HUGE my regular wave is probably comprable to your goofy with that weight. maybe if i took some weight out of the bow i would get more push and just a shorter pocket. i have an IBS full on top of the seats. Confused, where is the 750 and the 350-400? You really want that back corner dug in, get the biggest bag back there if it isn't. 350-400 = center ski locker. at least i think its a 750 i was told that it was but i'm starting to question that. anyone have a picture of the rear compartment with a full 750?? Well I'm no expert but it also looks like you're too close to the transom for the sweet spot. Might also be going too fast as I don't see much curl behind you. jhart- few thoughts on the surf wave. ^^^ this is your total ballast correct? no other ballast or wedge? In all reality you need a ton more weight. literally, perhaps a couple tons. You are surfing a VLX with only around 1400-1700lbs. those specs ^^ up there you think you have are for fully cubed out filled bags.... round each of them dow 10-15% for how they fit in the compartments. I couldnt disagree more with Petire saying you are over weighting your boat. Not even close. There are folks running 4-5000lbs in their VLXs. He needs it? Just to learn where the sweet spot is? Defintely not too much but I think he's got enough to learn, just need to adjust placement and speed. I never, ever, ever want to be in a tilted Sunsetter VLX with "a couple tons" of weight. 1500-2000 is plenty, especially just getting started. Here's a good thread with your hull and people who have spent awhile dialing it in. Most are in the 1600-2200 range. Any more than that, and your rubrail is going to be submerged. Not having the wedge makes it a little more challenging (as I've experienced), but you can easily toss the rope with your current weight once you dial it in and get more comfortable. Speed was probably a bit fast at 11.6mph. Those weight are pretty close to actual the bag sizes are much larger than that and the 750 was bursting at the seams with no air. But still unsure it's a 750. Seems small. his #1 question up there was asking how the wave looks.... its tiny, and he is a bigger guy. A little bigger wave would legthen the "sweet spot", and give some more push. Ya I understand he is a beginner, I saw that part. 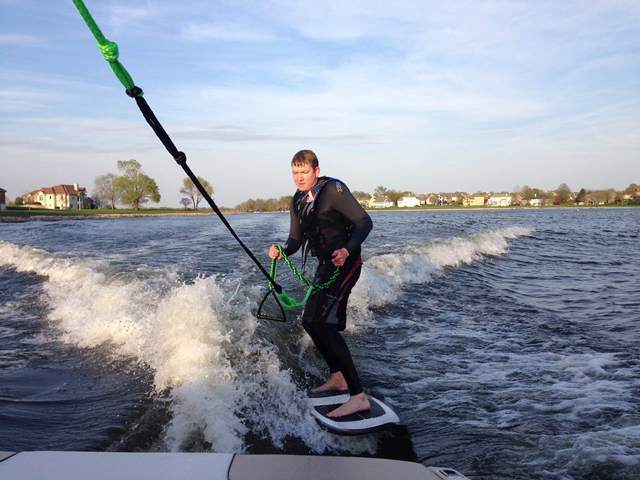 Ive probrably taught 20-30 folks to wakesurf, most are up and riding in their first 3 pulls if they listen, ropeless in about 15-20 mins of surfing.... fairly confident I got a grasp of whats going on here. My point was, he may think he has his boat slammed....I'm saying more weight would help. He is already up and riding, has his balance, ready to progress.... One guy up there told him to take weight out? I regularly start new beginners on larger waves than that and they do just fine. If you guys regularly keep 200lbs+ guys on tiny waves for a long time... keep on with that. Im trying to help OP get ideal conditions to get to the next step. No, you specifically said he needed at least another ton, maybe two. So you're either confusing the '04 and prior VLX hulls with the hulls post-'05, or you've never been on the SV23 heavily loaded for surfing . The rubrail is in the water at around 2000 lbs. Any more than that and it gets sketchy quick and, frankly, without much benefit in wake. These smaller boats can be overloaded, and there is such thing as diminishing returns. Read that thread I linked. Those guys have been trying to perfectly dial their wake for years, and NO ONE is surfing with over 2500 lbs. with that hull. It's neither practical or beneficial. His current set-up isn't too dissimilar to some of the ones in that thread; just needs a little tweaking. At MOST, the OP could consider a 400 or so for on top of the seats to compensate for a small crew. I usually appreciate your advice, especially on surfing/ballast but I think you missed it here. You suggested that he literally needed like a ton or 2 more weight but failed to mention he'll also need a new ~$600 prop as well. So you basically told him he needs to drop a bunch more coin before he can start learning. I respectfully disagree. You keep on as well. I've probably taught 21-31 folks to surf, and most are up in 2 pulls even if they don't listen, and ropeless by 14 minutes on average...internet....fact!! I ride that same board, 5'6" model... 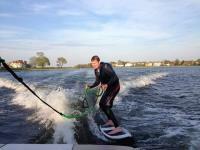 I will be curious if your new board gives you any different outcome staying the wake. The koal fish is pretty buoyant and seems to help people stay in the wave. As others mentioned, leaning forward will help you. Front leg is your gas, back leg is the brake. Also kneeling down lower will help, don't stand up straight. Keeping the board pointing at rear transom corner also helps a bit. Good luck, you look like your close to being ropeless! Don't forget deep water. At least 10-12 feet. more is better! I think I will slow it down and take a little weight out of the bow next time.